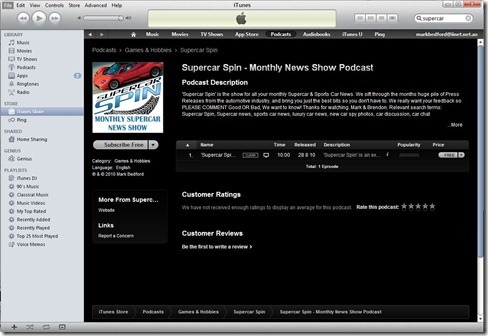 Apple approved our Supercar Spin Pilot show today so it is now up on iTunes for anyone in the world, anywhere to see. To get to it, go to iTunes on your iPod, iPhone or computer and search for â€˜supercar spinâ€™ and it will come straight up. Now we will gauge how popular it is on YouTube and iTunes, look at the feedback comments and viewing figures to decide wether to make another episode.